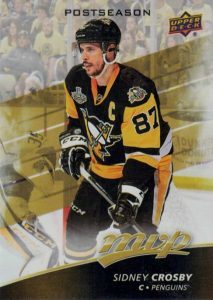 The earliest release of the NHL season, the 2017-18 Upper Deck MVP Hockey checklist takes a more basic approach but still provides collectors with a lot of choices. Similar to the 2016-17 set, every hobby box promises multiple inserts and parallels while offering a shot at some rare hits. The 200-card base set adds 50 High-Series Short Prints (1:2 packs) along with parallels like Silver Script (1:4 packs), Super Script (#/25), the new Black Super Script (#/5), and Printing Plates (1/1). Of course, Puzzle Back (1:4 packs) cards can be combined to make a larger image. Also playing off the 2017-18 Upper Deck MVP Hockey base set, Colors & Contours (1:4 packs) presents a colorful view of the league with Spectrum Light F/X technology. There are nine different subsets of varying rarity via the Blue, Gold and Purple versions combined with three different die-cut Levels. 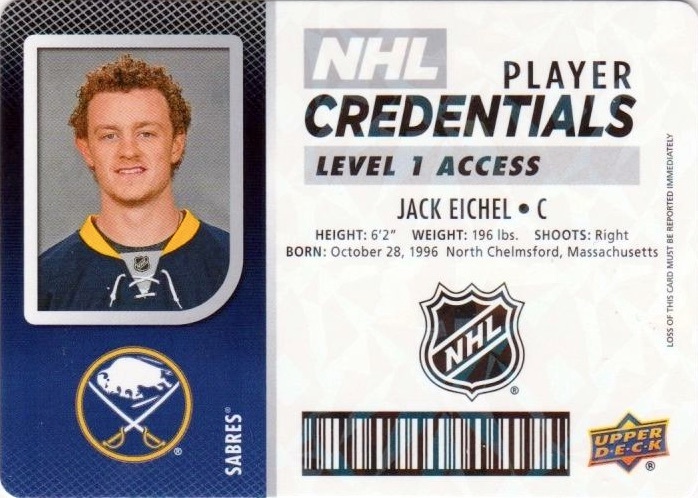 A new addition to the set, NHL Player Credentials (1:5 packs) displays the look of an ID badge with Level 1 Access (1:8 packs), Level 1 VIP (1:67 packs), Level 2 Access (1:20 packs), and Level 3 Access (1:200 packs). There are even case-hit Level 4 All-Access Autograph (1:320 packs) editions. 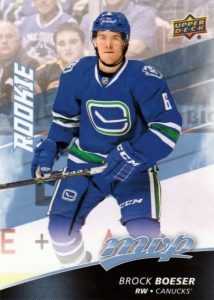 While the product is too early for many of the '17-18 rookies, 2017-18 Upper Deck MVP Hockey still packs Rookie Redemptions (1:400 packs) at one per case, that each yield eight rookie cards grouped by the NHL divisions. 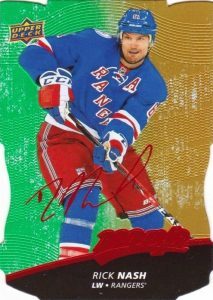 Much more rare are the 2017 NHL #1 Draft Pick SP Redemption inserts in Base (1:1,250 packs) and Gold (1:12,500). Master odds key: h = Hobby, r = Retail, b = Blaster, f = Fat Pack. Overall Odds: High Series SP - 1:2 hobby, 1:4 retail/blaster, 4:3 fat pack. PARALLEL CARDS (#1-250): Silver Script - 1:3.3 h, 1:6.6 r/b, 1:1.25 f; Gold Script - #/100 (Blaster); Super Script - #/25 (Hobby); Printing Plates 4/4. HIGH SERIES PARALLELS (#201-250): Super Script Black #/5 (Hobby). Overall Odds: 1:1,250 Hobby, 1:12,500 Retail/Blaster, 1:3,000 Fat Pack. PARALLEL CARDS: Gold - 1:12,500 Hobby. 4 redemption cards, each for a divisional set. 32 total cards. Shop on eBay. Overall Odds: 1:400 Hobby; 1:4,000 Retail/Blaster; 1:960 Fat Pack. 250 cards. Overall Odds: 1:4 Hobby packs. Shop on eBay. Blue Odds: Level 1 Blue - 1:15 h; Level 2 Blue - 1:20 h; Level 3 Blue - 1:40 h.
Gold Odds: Level 1 Gold - 1:20 h; Level 2 Gold - 1:27 h; Level 3 Gold - 1:48 h.
Purple Odds: Level 1 Purple - 1:80 h; Level 2 Purple - 1:100 h; Level 3 Purple - 1:400 h.
200 cards. Shop on eBay. Overall Odds: 1:3.3 Hobby, 1:6.6 Retail/Blaster, 1:1.25 Fat Pack. Overall Odds: 1:7 Hobby, 1:15 Retail/Blaster, 1:3 Fat Pack. PARALLEL CARDS: Level 2 - 1:20 Hobby, Level 3 - 1:200 Hobby. Overall Odds: 1:67 Hobby, 1:133 Retail/Blaster, 1:25 Fat Pack. Overall Odds: 1:320 Hobby. Specific group odds noted below. Not listed on final checklist. Let us know if you spot any others. 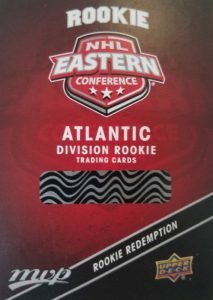 Just a heads up remember that Upper Deck does not have the autograph rights of the projected number one pick Nolan Patrick. Hopefully the price will go down since they cheaped out. No elite franchise changing rookies this year but there should be some decent carryover rookies in this product like Josh Ho Sang, Clayton Keller, Charlie McAvoy, Colin White, Alexander Nylander, etc. This may be the year where most of the good rookies are in the early products as the current draft class was extremely weak. The one thing Upper Deck has to do to keep the prices for their products under control as there is no McDavid or Matthews to push an expensive product. Impossible to rate this product, no checklist available and the release date is supposed to be in 4 days. What is the reason for the delay? Checklist isn’t bad as it includes some not great but decent carryover rookie cards. It would be nice if Upper Deck went back to having a series 2 of MVP that included all of the top rookies drafted that year instead of making collectors find limited redemption cards or those rookies. 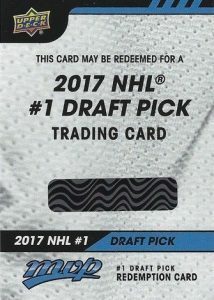 Yeah I know this years draft was bad but it would have been nice to open Series 2 packs to try to find regular issue McDavid or Matthews cards the past few seasons. At least Upper Deck did do right for collectors on a budget when they brought back Parkhurst and regular numbered high series OPC products last season. Not all collectors have an unlimited budget or want to pay hundreds if not thousands on hockey card products. Nolan Patrick would not have had an autograph in this product anyways– the new rookies never do. They can still make cards of him though. hi trey thanks for the checklist i pull a nice phil kessel postseason #ps-7.for your info. 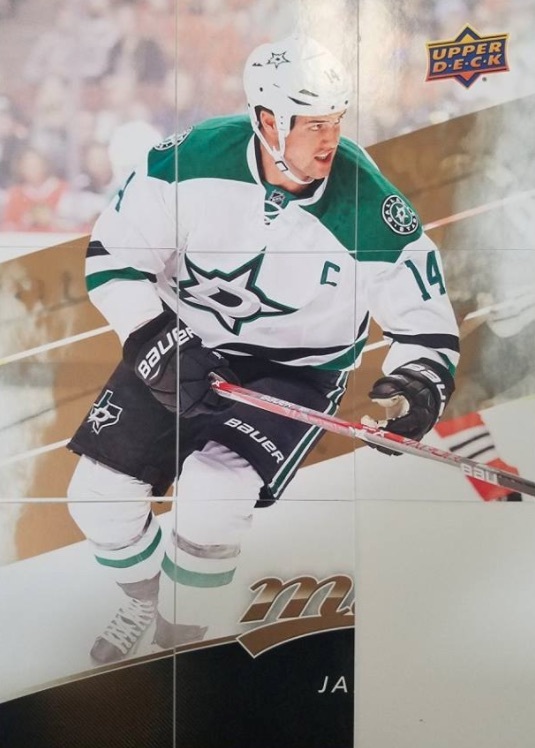 I bought 10 boxes of the 17-18 Upper Deck MVP. I have found over 100 cards that are either missed cut or the back of the cards are printed at an angle. Weak autographs selection. No relics or manufactured cards. Wish I would have wait till the price dropped before buying this. The cards have a very cheap feel this year. I know that this is a lower end product, but I liked the 2015-16 set that I built. These are not nice cards. They dropped the Prosign Autos which were nice cards, as well as the Territories Materials and Autos, which were also nice inserts. 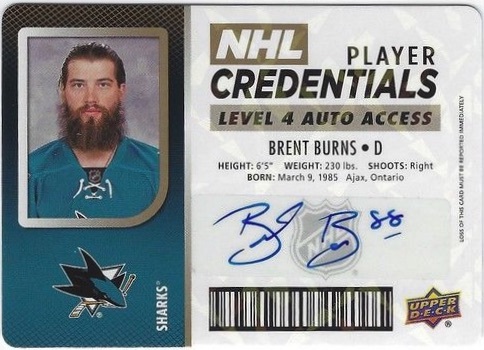 I don’t care for the “Credential” cards, they look like drivers licenses, nor do I care for the C&C this year. Mostly though, as I say, the cards that are there feel like they were printed at home. E-Packs added “all-star variations” as an easter egg hit. I hit the Ovechkin card. Low end product. First of the season. A nice introduction to the hockey season, although most of the good rookies are absent. They removed the Territory inserts and they replaced them by Credentials. Not sure this was a good move especially that there’s almost no difference between the levels. Also, this year there are no memorabilia, so that’s a minus.The design of the Colours this year seems nice. Does anyone have a list of which cards form specific puzzles? My 6yo wants to complete the Auston Matthews puzzle but I don’t know which pieces I need to keep an eye out for. there is no checklist for /25 and /100 superscripts, but today, I saw superscript /100 first time and they are beautiful, like /25… Anybody has a checklist of those limited cards? Both are noted under parallels to the base set. PARALLEL CARDS (#1-250): Silver Script – 1:3.3 h, 1:6.6 r/b, 1:1.25 f; Gold Script – #/100 (Blaster); Super Script – #/25 (Hobby); Printing Plates 4/4.